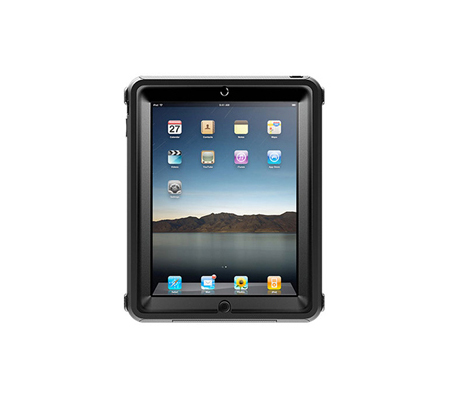 The OtterBox Defender Series Case for the Apple iPad offers virtually unmatched rugged protection. Three layers of protection include a Self-adhering clear protective film, a hi-impact Polycarbonate shell, and a silicone skin to absorb bump and shock. Stowing your iPad away for the night or for your commute? Simply remove the back polycarbonate cover and snap it over the face for ultimate touch screen protection. The built-in stand will come in handy while trying to watch a movie or video, and creates a comfortable browsing experience. When using your iPad on a flat surface, the silicone grip pads on the bottom will hold your device securely in place. The case is also designed to accommodate the optional iPad dock accessory! Take your iPad everywhere you go knowing that it is safe from the occasional drop, bump and/or scratch.